During my college days, my friends and I go to Galvan Street in Dagupan City every month just to eat Pigar-pigar for our dinner. Pigar-pigar is one of the most in-demand food in Dagupan City, and people from nearby towns visit Dagupan City just for this. 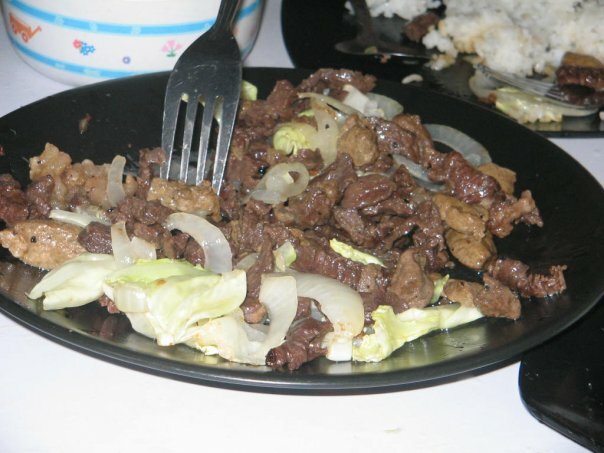 Pigar-pigar is a thinly sliced carabao's meat or cow's meat (beef) which are seasoned purely with salt and pepper. And cooked deep-fry. And depending on the costumers, they may put some add-ons to this recipe like, onion rings, sliced cabbage, cauliflower and others. When I was young, my father used to eat Pigar-pigar in Galvan Street, Dagupan City. He often brings me there, but I never have the guts to taste it, not knowing that it really taste so good. One more thing is that Pigar-pigar doesn't sound good. Yet I was wondering why do people still love this pigar-pigar. And so during my college days, my classmates invited me to eat dinner in Galvan Street. And there, finally I have no choice but to eat pigar-pigar for dinner. And I was expecting that it would be a problem for me later on thinking that I might not like the taste of pigar-pigar. Unexpectedly, it just turned out to be so good. I enjoyed eating pigar-pigar. And I ask my friends to go to Galvan at least once a month to eat pigar-pigar for dinner.